Give a Ruby Tuesday Gift Card to anyone who likes casual dining with outstanding food served in comfortable, stylish surroundings. From the create-your-own Garden Bar to a tender Asiago Peppercorn Sirloin or Hickory Bourbon Salmon with a White Chocolate Cherry Cheesecake to finish, the experience is a total delight. For lunch try a handcrafted burger made with 100% USDA Prime or Choice beef. 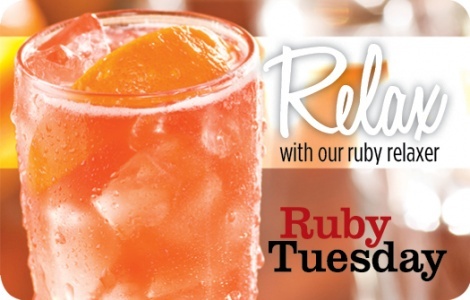 Your friends will love getting Ruby Tuesday Gift Cards.